This morning chris of course had a full on breakfast for me french toast, eggs, hash browns, ect. He asked me what I wanted to do today. He said we should go to vegas and he laughed after. Well I took him serious and got the family ready and in the car before he could change his mind. 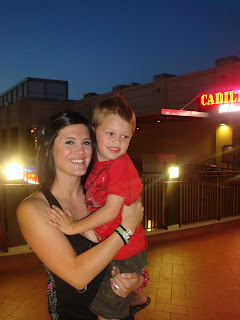 We went down and took my mom to dinner at Cadillac Ranch. The funny thing was chris had surgery a week and three days before on his knee. 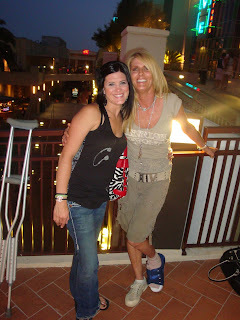 And my mom had surgery five days before so we had both there legs elevated everywhere we went it was a great day trip. 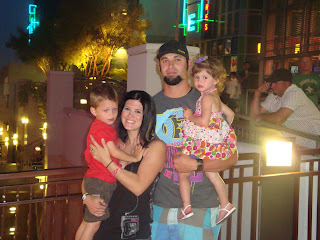 I got to visit both mom's in vegas i don't know how I got to pull that off. Thanks chris for the new phone and for being a wonderful husband. And to my mom's thank you for being so amazing to me. I love you both. happy mothers day cort. you are beautiful! love those kids. Ahahaa! I got a new phone for Mother's Day too - silly Stucki boys (but I didn't get to go to Vegas! - furthest I went was down the street to church : )) Sounds like you guys had a fun day with your handicapped family! Just wanted to thank you guys for the best Mother's Day ever. I Love all of you. Thanks Cort Chris Peyton Preslee Ashley and Landon. 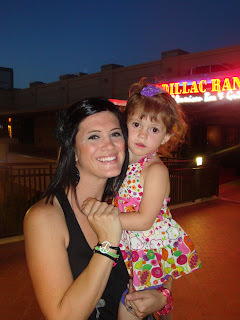 You are such a Hot Mama, and have the cutest kids!